This month, we have a confession. We’re in love with combination therapy and we want YOU to know it! 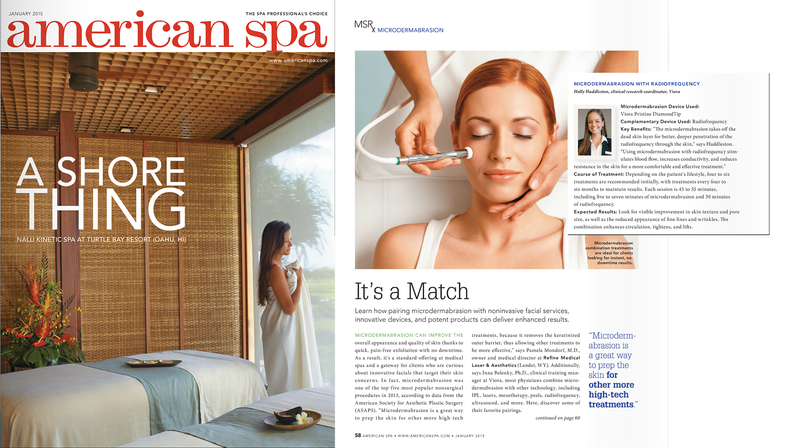 This month, it’s all about microdermabrasion and radiofrequency. Microdermabrasion is yet another wonderfully non-invasive treatment that provides immediate, zero-downtime results and is the perfect skin prep for other treatments that target your skin on a deeper level. It’s no wonder this quick and painless exfoliation has become a staple in many skin care routines. In fact, according to data from the American Society for Aesthetic Plastic Surgery (ASAPS), it was one of the top 5 most popular non-surgical treatments of 2013. Here at Viora, we like to use it prior to any treatment, especially radiofrequency. We’re talking face, neck, décolleté, hands, arms, legs, booty…EVERYWHERE! It’s a fast and affordable way to enhance the effectiveness of your treatments. By removing the outer barrier of dead skin it allows for deeper penetration of radiofrequency throughout the skin. This stimulates blood flow, increases conductivity, and reduces resistance in the skin for a more comfortable AND effective treatment. How does it get any better than that? All this can be done in less than an hour and there’s no downtime! Sessions last about 45 to 55 minutes (depending upon your treatment); just 5 to 7 minutes of microdermabrasion and 30 minutes of radiofrequency. So what are you sitting around online for? Get out there and treat yourself to one of Viora’s advanced skincare treatments today!